A mixed exhibition in aid of Children’s Hospice South West, created by participants in courses run by Claire Western at The Old Brick Workshop. With Claire’s professional guidance and enthusiasm some truly wonderful work has been produced. The artists on the courses vary from complete beginners to already competent painters, and their work covers many mixed mediums and techniques. Colour theory and experimental painting. Come and learn how to use combinations of vibrant colours, taking inspiration from artists and theorists. Then use this new understanding in your own imaginative natural forms,paintings and collages. All materials provided and all abilities welcome. You don’t have to be an artist just bring your ‘have a go’ creative spirit! Slide show of work produced by students on some of the courses this term. Our exciting new range of courses, that started at The Old Brick Workshop this January, has proved so popular we have extended the program of events until June. Claire Western is a professional artist who, alongside creating, showing and selling her own work, has been a very successful teacher of a wide range of creative art over many years. 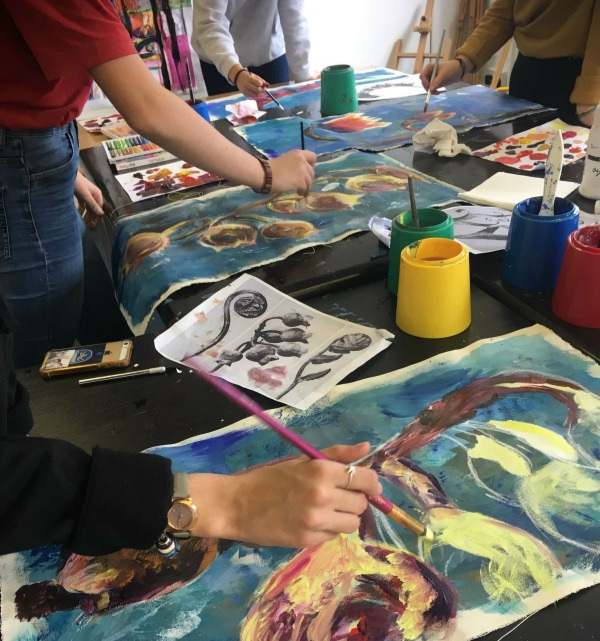 These courses are designed for students of 14 – 18 who are interested in Art, possibly studying it for GCSE or A level and who would like to expand their knowledge and experience. We will be making monoprints, collagraphs, etchings and printing over a range of prepared surfaces. Students will also be introduced to working with mixed media and exploring all the expressive possibilities of unusual combinations of surface and colour. Subjects will be provided, but individual choices may be prompted by GCSE or A level themes and focus. This is a great opportunity to add to the range of work in a portfolio for exams and Foundation portfolios. All materials, papers, painting supports and the use of a press will be provided. Each session will produce completed work so you can do one or all of the courses. Spend a day making a deer, fox, dog, goose, creature or sculpture of your choice using willow. Stefan will teach you how to weave and tie the willow and then guide you through the process to build and create your unique sculpture. This workshop is run in a friendly, small group environment and is aimed at those who just want to give it a go. No experience needed just bring enthusiasm and lunch. Be proud to take home your own hand crafted sculpture for your home or garden and the skills to make more. The course will be running over two days, using either acrylics or oils and will be suitable for beginners or improvers. The focus will be on simplifying our subject by concentrating on the big shapes and learning about colour, composition and tone. Each student will be able to work at their own pace and with a maximum of 7 students you will be ensured plenty of one to one tuition, including demonstrations from Caroline.